Father’s Day is a day to celebrate fathers, and we definitely did that at Spohr Haus this year. But for me Father’s Day is also a day to celebrate Maddie. Since she isn’t here to celebrate me, I celebrate her. It’s how I get through a day that became very complicated after Maddie passed away. Little feet pounded the floor and Annie appeared charging toward me clutching a card. “Happy holidays!” she yelled. Heather, trailing behind Annie, just shook her head. The three of us snuggled in bed as I opened my beautiful cards, and it was great. Annie even drew on hers. I’m not sure what she drew exactly, but crayon marks definitely were on the card. Good job, Annie! If you’re wondering why I just got cards, it’s because I’d already been given my Father’s Day gift a few weeks ago – a ticket to see the Beach Boys in concert! It was pretty awesome… I even got to take my photo with the band! I immediately felt terrible. I always tell Annie, “You’re my baby girl, did you know that?” And now I’d told her I had another one. Annie knows Maddie is someone important to Mommy and Daddy. She also seems to be a big fan of Maddie herself based on how much she loves to watch Maddie videos, but she doesn’t know what a sister is, and hearing me call another little girl by a term of endearment I use for her could be traumatizing. Luckily, Annie didn’t seem to bat an eye at this, but it stuck with me. 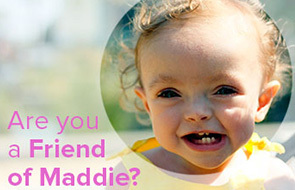 As time goes on finding the right words about Maddie is only going to get more and more important… and difficult. In the afternoon we went to Heather’s parents’ house to swim and barbecue, and it made for a terrific afternoon. At times though I was quiet and reflective, and Tia Leah asked me if I was sad because the Giants had lost. I thought for a moment, then nodded. On a nice afternoon like the one we were having, it was better to let people think it was because of baseball. I couldn’t be more proud that I get to call myself the father of both. When my Little Dude woke me up with “Happy Fathers Day, Dada!” my day was complete. The rest of the day, which was awesome, was pure gravy. Happy Father’s Day. I bet Maddie celebrated you in Heaven. I love how Maddie is part of Annie’s life. A hard but happy day for you. I think Annie will understand that her Daddy and Mummy love another very special baby girl too. OOHh Mike, you break my heart. I wish Maddie was there with you in person. I KNOW she was there in spirit! I wish that day was easiler for you but how could it be without sweet, beautiful Maddi?. Mike, please don’t worry your comment about Maddie hurt Annie. It obviously didn’t. I don’t think it’s a bad thing for Annie to know how loved (love) Maddie is….after all if Maddie was here, she would hear “I love you and your sister the same”. Sending you a cyber hug and support from me. NEVER, EVER forget what a GREAT father you are to both of your girls!! Both are very lucky to call you Daddy!! Happy Father’s Day, Mike. You are a great father to two wonderful girls. what a touching post, glad you had a happy Father’s day! Very sweet post, Mike. Happy (belated) Father’s Day! I watched teen mom the other day an one of the girls lost a sister to sids I. Thonk it was and every year on her birthday she celebrates her and she was crying for her loss of her sister and lamenting how her life might have been better with her sister still there. Your doing a wonderful job with the balance. Annie will love and miss Maddie like crazy. “Happy holidays” made me laugh out loud. I like Annie putting her own spin on it! Belated Happy Father’s Day to a wonderful Dad! Happy Father’s Day, Mike. What a fabulously touching post. I love the pictures of you with both your girls. Not only do you look happy holding them, but they both look equally as happy being in your arms. I’m glad Annie is there to fill yours. Take care. This is a touching post and I thank you for sharing. I know it has to be hard. You really are an awesome dad to both your girls but one thing struck me in this post, how you don’t want Annie to be hurt or feel less special when you refer/share with her about Maddie. With the type of grief you are experiencing the fact that you are so conscious about that really speaks mountains about the type of daddy you are to Annie. She’s just as blessed to have you as you are to have her. Of course we all know how blessed Maddie made your life. We won’t ever forget that. Aww, crying. I think it was the fact that you bring to light the children on Father’s Day (or Mother’s Day). They MADE us have that role and I’m so sorry you only get to remember one of your girls instead of snuggling them both. I struggled on Father’s Day, too, but not for the same reason. For me, it was the first Father’s Day I was apart from my ex and it stung. I appreciate the father he is to our son (despite disagreeing with much of how he plays that role, but still, I know he loves him), and will always remember what was good about us. It hurt to be away from him on that day (and from our son), but I sincerely hoped he had a great day and liked the gift my son and I got for him. You’re an amazing dad (and hubby). Keep up the good work! I should’ve known this post was going to make me cry. Although reading that Annie said “happy holidays” did make me laugh out loud. You’re right to be proud of both of your beautiful daughters, and they are both lucky that you’re their dad. Much love to you and your family. I think of you guys often (kinda weird, but true). I’m sure many have told you this, but I’ll chime in too. You’re doing a great job. Don’t stress too much. I see pictures of 2 beautiful girls with an amazing Dad. Beautiful post. I hope you had a great father’s day. I have been following your blog for a while but haven’t commented much. I came across a book earlier today that I wanted to share with you (your family came to mind after I read about you wanting to say the right things to Annie.) I am going to be getting to this stage with my little girl very soon. She is starting to learn more about her big sister that she never met. But the book I found has some great reviews and I wanted to pass the info along to fellow bloggers who may find it interesting. I’ll be buying one myself on payday! I love reading your blog and look forward to your posts every night since I am a night owl! I read your posts and can see what’s ahead for me a year from now. My second daughter was born January 18, 2011.